Everything you need to know about the New Orleans Saints entering the 2016 season, all in one place. Following a 7-9 campaign in 2015, the New Orleans Saints are looking to bounce back into NFC South contention this season. 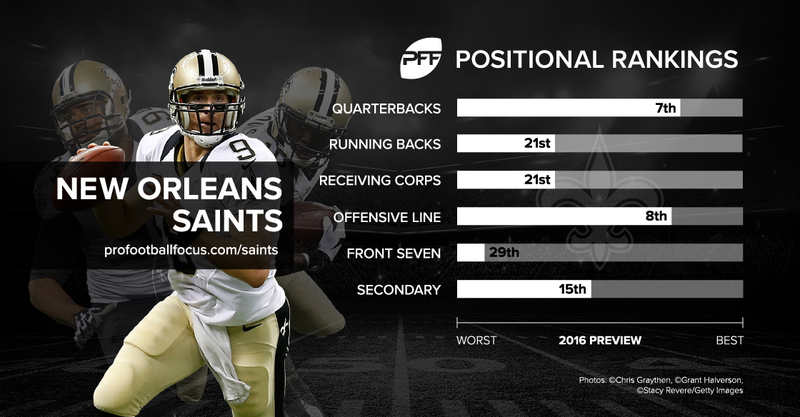 With a veteran signal caller and impressive line on the offensive side of the ball, can the Saints’ defense improve enough to vault New Orleans back into the playoff conversation? 2. The offensive line is very good, and has the potential to be great. The last truly dominant line I can remember was the Cowboys'. That line made Troy, Emmit, and Michael. Those guys were good but that team won on the line...every play just about. So I measure us against that and I just don't see that we are close. If I'm wrong that's great. I'll take a side of mashed taters with my Crowe. I think our oline is bad and I hope I'm wrong. Halo, Beastmode and pherein like this. The last truly dominant line I can remember was the Cowboys'. That line made Troy, Emmit, and Michael. captainshawn and WhoDatFan26 like this. Don't worry, your hope is true. Well we'll see. Let's just say the preseason didn't offer much encouragement up front. I know we played people out of position, had a big injury, etc. Giving all that its due weight I'm still worried. And the front 7, I KNOW is better than 29th -- but I guess they'll just prove that by the end of the year. If the Saints offensive line is even slightly above average, it makes sense that at least several, let's say as many as 14 of those teams that are better cut players that just barely miss their cut. It again makes sense that out of those 14 cuts at least three or four are worth looking at and it is not out of the realm of possibility that one or two might even be considered an upgrade to our already above average offensive line. Right? No, not at all. We brought in a tackle that no one wanted. We just brought back Evans, who a total of two teams even looked at, and the one that signed him ended up cutting him. none of these things are being done because Sean thinks our oline is good with the ability to be great. I never remember us looking for guards back when nicks and evans were doing their thing. My hope is that evans gives us enough this year at rg to hold things together. Peat looked better at LG. So there may be hope we could be just decent enough. That could get us to the playoffs.